Cut up the chicken breasts and marinate with paprika, olive oil, and salt. Be sure all of the chicken is well coated. In individual, shallow baking pan or Paella on a hot stove, add the remaining olive oil. Sauté the chicken in the olive oil until brown. Add the chorizo and cook for 5 minutes. Add the onion and garlic and cook for several minutes longer. Add the shrimp, calamari and scallops and cook for 10 minutes. Add the peas, mussels, red and green peppers, tomatoes, and 6 cups of the reserved stock. In a small bowl, mix together the brandy and the ground saffron. Add the broth and brandy mixed with saffron. Cover pan and cook for 10 to 15 minutes until rice is al dente and all water is absorbed. If you need more broth, add to it. Before serving squeeze lemon over all. 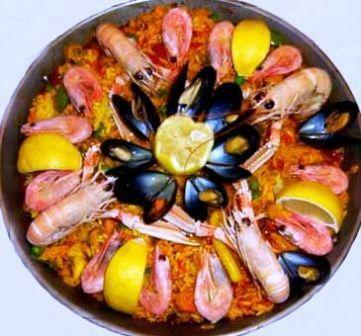 Arrange on platter artfully, with mussels around the sides and shrimp poking out.